Chronicle Books is excited to accept submissions for our NEW 1 YEAR Design Fellowship program. 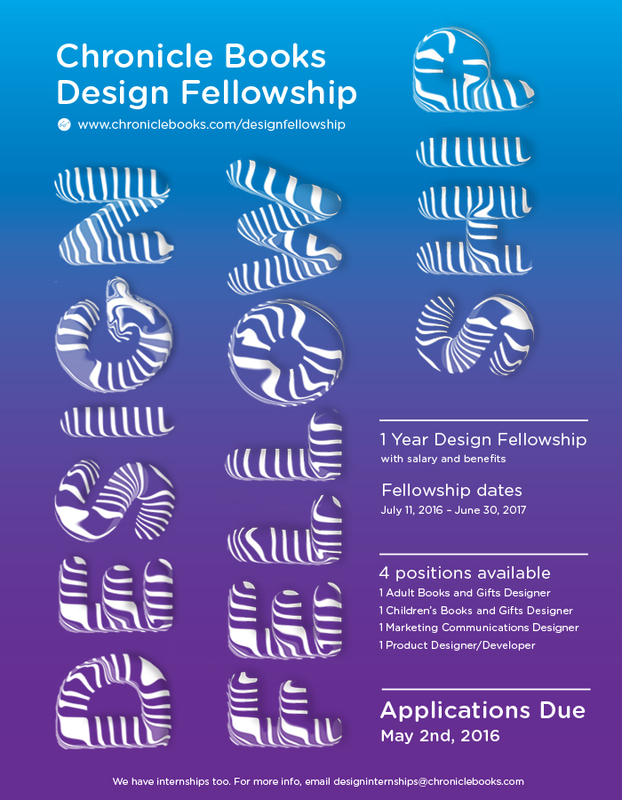 Four fellowships are available in our Publishing Design, Marketing Design, Children’s Design, and Product Development groups. These fellowships provide six months of hands-on experience for recent graduates interested in embarking on a career in publishing, package, or product design. All pages labeled with your name and the group you are applying to *All applications must meet these exact requirements to be considered. Graduated with an accredited, undergraduate or graduate degree in design within the past 24 months. Design candidates only. The Adult Books & Gifts design fellow will be a designer for the Food and Drink, Lifestyle, Art, and Entertainment Publishing Groups. In addition, they will have the chance to assist in creating original and existing brand support products in various stationery and specialty packaging formats for these groups. The Children’s Design Fellow will work on book and gift designs geared specifically towards children and young adults. They will have the opportunity to design a variety of book formats while working with illustrators and previously established brands. In addition, they will have the chance to assist in creating original and existing brand support products in various stationery and specialty packaging formats for this group. The Marketing Design Fellow will work with the Marketing Communications team to create collateral materials to promote a range of products for all publishing categories, while also exploring Chronicle Books’ overarching brand and identity. Projects include advertising, signage, brochures, posters, displays, invitations, event kits, catalogs, promotional giveaways, sell-sheets, sales materials, promotional videos, and corporate identity. Supports the needs of the in-house design team by assisting with various design, production and administrative tasks. This is an opportunity for new designers to gain valuable insight into the publishing industry and gain a better understanding of the design process behind our books and gifts. All applicants for the design internship position must have a strong interest in book, publication, or packaging design along with a background in graphic design. Current students or recent graduates are welcome to apply. Graphic Design or Industrial Design candidates only.